National 4-H Week is Oct. 2-8. CHILLICOTHE, Ohio — When Jacob Shuman was little, he sometimes tore his homework into pieces in meltdowns of frustration. Adopted as an infant from Guatemala, it took years for his fetal alcohol syndrome to be diagnosed, which explained his unusual learning disabilities: He could add, but not subtract. Multiply, but not divide. He’d understand a concept one day and forget it the next. It didn’t help that he was shy and had trouble speaking in front of others. Fast forward a few years: Now a senior in high school, Shuman has developed his own outreach program, focused on the importance of honey bees and the plants they pollinate, that he has presented to more than 500 children and adults. As a result, this past spring he was awarded a 2016 Youth in Action Award in Agriculture and Animal Sciences from the National 4-H Council, earning him a $5,000 college scholarship. And international corporations have already expressed interest in offering him internships as he pursues his degree. Shuman and his parents fully credit his success to his participation in Ohio 4-H.
Shuman started in 4-H as a Cloverbud, the organization’s program for kids ages 5 through 8. “Jacob and his dad and younger brothers (twins, also adopted) were involved in Cub Scouts, but I felt left out,” said his mom, Jo Shuman. She couldn’t participate as fully in those activities as she would have liked, she said. Ohio 4-H is the youth development program of Ohio State University Extension, the outreach arm of The Ohio State University’s College of Food, Agricultural, and Environmental Sciences. The key ingredient of 4-H is the combination of hands-on learning activities with the oversight of caring adult mentor volunteers, said Tom Archer, state 4-H leader and assistant director of OSU Extension. With 6 million members, 4-H is the largest youth development and mentoring organization in the nation. Although 4-H is largely known for its animal husbandry programs — and the Shuman brothers do raise eight goats between them — Jacob’s first project was in meteorology, followed by two insect projects. 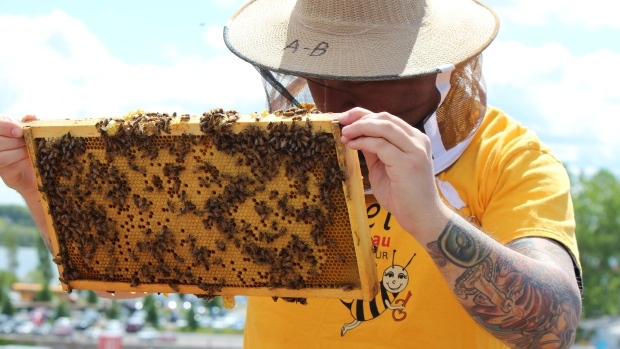 Because of the project, Shuman and his mother joined the Scioto Valley Beekeeping Association and connected with beekeepers throughout the state. They have attended workshops in Illinois, Kentucky and Michigan. As he progressed, Shuman became more and more enthusiastic. One hive expanded to 12, which then became 13 when a queen wasn’t laying properly. And one day in late July, as he was checking his hives, Shuman noticed a cloud of bees gathering in a nearby tree. Last year, Shuman developed the outreach program TEACH B’s: Teens Educating Adults and Children about Honey Bees, to not only spread the word about the importance of protecting honey bees but also about eating plenty of the produce they pollinate. Its primary target is children in pre-K through first or second grades. He also talks about honey bees to older audiences. Chris Bruynis, the agriculture and natural resources educator for OSU Extension in Ross County, asked Shuman to present to the Ross County Farmers Club about the importance of bees. “That was the first time in my 22 years of working in Extension that I invited a 4-H’er to talk with adult farmers,” Bruynis said. “They were impressed. Shuman also shares his personal story with others. “I used to keep everything secret, but about a year ago at a public speaking event, I revealed that I had fetal alcohol syndrome,” he said. “It surprised a lot of people. It felt good, because I always had that monkey on my back, and I had to get it off. Shuman’s outreach efforts extend beyond his TEACH B’s program. With his Youth in Action Award came an additional $5,000 to the Ross County office of OSU Extension. 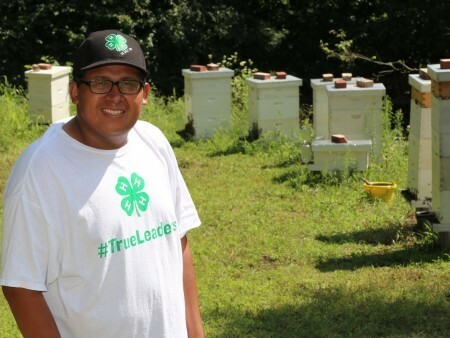 Shuman suggested that the funds be used for two $500 scholarships for the next five years for any county 4-H member who wanted to take the beekeeping project. Shuman said he also hopes to be able to provide mentorship for younger beekeepers. Shuman and his parents also credit 4-H for helping him develop his public speaking skills. “The first time he gave a speech at a 4-H club meeting, he had it in front of him, he was looking down, he was kind of mumbling,” Jo Shuman said. “Now, he doesn’t even need to look at the speech. It’s impromptu. Jo Shuman said 4-H gave her son the confidence to go out and try things that he perhaps wasn’t good at initially. Jacob Shuman said the presentation skills he developed through 4-H will have a lasting effect. Shuman hopes to attend Ohio State’s Agricultural Technical Institute in Wooster for his first two years of college, to work with noted bee researcher Reed Johnson. Then he’d like to transfer to the Columbus campus to finish his bachelor’s in entomology and add a minor in Extension education. Joe Shuman, Jacob’s father, said he had concerns about his oldest son when he began struggling in school. The Shumans said their younger two sons have also staked out career paths through their involvement in 4-H. One has taken robotics projects since his first year and wants to go on to study robotics engineering; the other has taken many projects, including rocketry and electricity, and plans to study electrical engineering. Both then want to go on to medical school. “It’s because of 4-H,” Jo Shuman said. “It’s given all my boys their purpose in life. 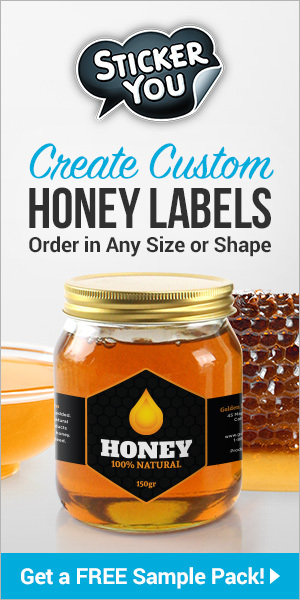 Previous articleCATCH THE BUZZ – How a prebiotic honey provides health and wellness benefits to consumers. And it’s the only one that does!